Time for another soup post, me thinks. The last few weeks have been quite odd and somehow the sodding cold I caught while travelling provided some unexpected relief from thinking abut my father’s passing a couple of weeks ago. Now, the cold has finally buggered off, and not only am I finally getting back to sleeping and exercising, but I can also taste delicate flavours again. 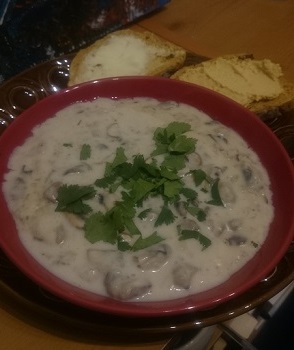 So, what better way to celebrate than with some home-cooked cream of mushroom soup?! Melt the butter in a medium saucepan over medium heat. Add the mushrooms and onions and sauté until the onions release their liquid and are softened, about 5 minutes. Add the flour and continue to cook for a minute or two (mixture will be very stiff). Slowly add the milk, whisking constantly. Add the cayenne pepper and the salt. Bring the mixture to a boil. Cook for about 2 minutes, or until the soup is slightly thickened. N.B. I like my soups thick-ish, but a little more milk would thin this down further if needed. Previous Previous post: Neil Gaiman: American Gods – Reading progress update @ 12%.